All of Titan’s Competition Kettlebells are uniform in dimension and handle thickness, allowing you to train the exact same movement while also increasing or decreasing weight to cater to your routine. - Colors: Pink, Blue, Yellow, Purple, Green, Orange, Red, Black, White, Gold. The Titan Fitness Competition Kettlebell is the perfect tool for building strength and toning your entire body. This solid kettlebell is constructed as one piece for ultimate safety and durability. It has smooth handles and excellent balance making it great for competition training or just having a quality KB for your home gym or Crossfit WODS. I love the coating on the weight. It keeps the enamel from chipping, and since I keep it in the garage the coating protects the weight from moisture as well. 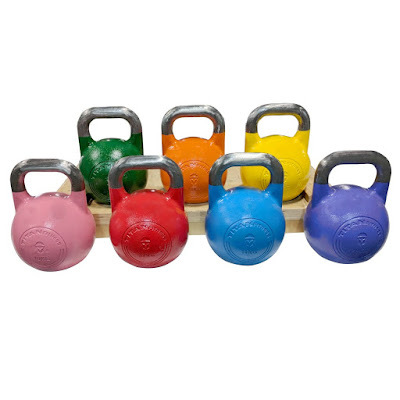 The different color helps me distinguish the weight from other kettlebells immediately which is a nice bonus. I've used cast-iron kettlebells for several years and wanted a sport/competition kettlebell for a smoother handle surface. I naturally thought of Titan Fitness as I already have a cast-iron bell from them that is well-built and many other pieces of affordable fitness equipment. My favorite aspect about the design of these bells is the thicker handles which make the bells more comfortable in the rack position. That said, some people with smaller hands find the thicker handles to be an issue. I only mention this as something to consider. The coloring of the sport bells is also really cool. It feels great when you're able to move up in weight and use a new color as all of the sport bells are the same size. I definitely think this product feels a little more comfortable on the forearm and wrist than the cast iron bells and the handle is smooth but not slick. This version of competition kettlebell is distinct for its use of an advanced coating, originally established in the gun industry for its remarkable durability in thin applications. This unique finish can deliver superb abrasion/wear/corrosion resistance over time—100X that of other coatings—and it’s available to order in a range of exclusive colors, such as Green as seen here with the 24kg kettlebell . I believe everyone should order a kettlebell from Titan Fitness (cast iron or competition, it does not matter) as it is the ultimate piece of home workout gear. Quick workouts with swings, presses, snatches, high pulls, get ups, running, and body weight movements will make it so you will never have an excuse to not get in your workout. Add on the ability to easily travel with it makes this item a no brainer! It is a top shelf product, beautifully fabricated and finished at a super competitive price: truly Professional Grade! You’re wasting your money on any other competition bell.